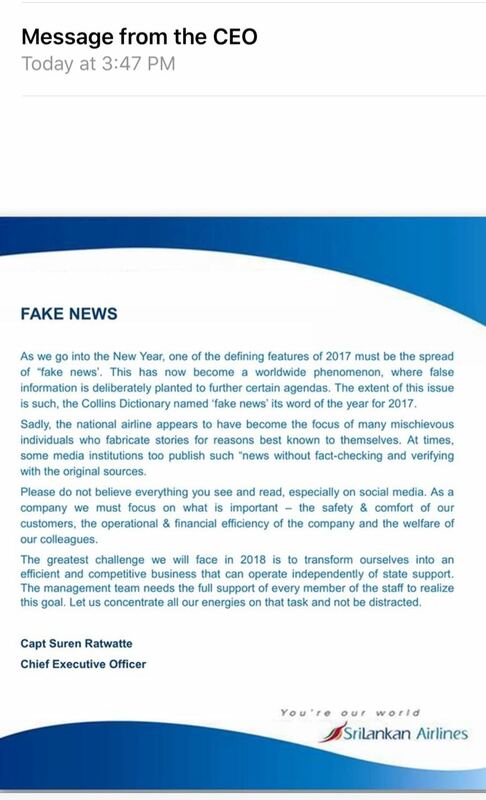 Loss making SriLankan Airlines CEO Suren Ratwatte who refused to provide his salary and perk details, sent out a New Year message to all employees of the national carrier stating the defining moments of the year gone by was the spread of ‘Fake News’ regarding the airline. Going on to educate his staff, he said that even the Collins dictionary had named “Fake News” as the most popular word used in the year 2017. However on the 20th of December 2017 the Government spokesman and Minister of Health, Nutrition and Indigenous Medicine Dr. Rajitha Senaratne speaking to journalists at a press briefing sternly said that both the loss making Chairman Ajith Dias and CEO Ratwatte of SriLankan Airlines must be removed. It is still to be established if CEO Ratwatte sent these letters out in English and Sinhala to garner the support of his staff fearing his ouster from the airline due to a certain Board Member eyeing his seat. 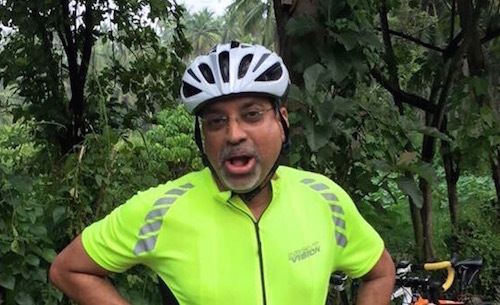 A close associate of CEO Ratwatte speaking to Colombo Telegraph said that CEO Ratwatte was perplexed regarding a series of exposes carried out by a certain television station that has close links to one of his current Board Directors. “Rakhitha Jayawardena’s daughter is married into the Maharajah Organization’s owning family. Its unthinkable as to how such critical inside information about the national carrier keeps leaking out to this one particular television station. They simply keep attacking the Chairman and CEO but keeps protecting the Board of Directors of which Rakhitha Jayawardena is a part of. Actually Rakhitha was hailed on the same television channel’s prime time news segment in January 2015 for having been honored by a UK company when they bestowed a Lifetime Achievement Award in the duty free business. We all know that even that company in UK is owned by a personal friend of his,” CEO Ratwatte’s close aid said. There was a news report which said that the whole management offered to resign. so, that was a lie. The bottom line is has Ranil wickramsinghe done anything that works. HE appointed Rats to every thing. another report said they borrowed with the cabinet approval another $ 125 million. So, that is will be another loss added and gioven to the group of rats. this is how UNP govt supports it’s voter base. Just imagine the type of “Message” a CEO of a National Carrier issues at the end of a calendar year and at the beginning of a New Year to the employees. The “MESSAGE” itself is proof of the CALIBER of this questionable “CEO” and the Prime Minister who appointed him at the behest of his own (PM’S) Secretary. What would the rest of the National Carriers and the International Aviation Industry personnel think and how would they assess these sets of Jokers and Clowns who handle Governance of the country and the Public Institutions? Isn’t it STINKING and DISGUSTING? Yes it is. Soen where else I read, that this govt also is responsible for bankrupting the airline. Politicians won’t let it go. Because, they won’t be able to get free at their will. Sri lankan air line is in debt for $ 702 million. Out of 24 planes only a few are airworthy. but, the no of employees are over 7000. Simply it is a mess. What a poor behaviour for a CEO of a national institution. But not a surprise. Now the mob lashes into each other like animals. There is not a jot of decency and moral. And after all, Ratwatte still didn’t get the message. How ignorant can someone be? There is no future for him in this airline. Wake up CEO! Your dream is over! Run to Australia and fly a kite! Fake news is a typo. He ment fu$k news! The guys are so messy that the employees got no respect or any regard for these jokers. End of the year message from a civilized ceo could have meant so much for the staff if it was written with genuine and honorable intentions. Ranil will pay the price by next schedule change. Pack your bags mate. The CEO must tell the staff what he achieved – if any! PS: The bonus and perks are NOT achievements.